Summer is officially here people. Get your strap tops out and your shorts ON! I love the warmer months; everywhere you go you can smell barbecues and everyone just seems so much happier. It's amazing what a bit of vitamin D and long nights can do. So with these warmer months finally here to stay (or so we hope!) I thought I'd do a little summer edit; 3 outfits over 3 weeks. 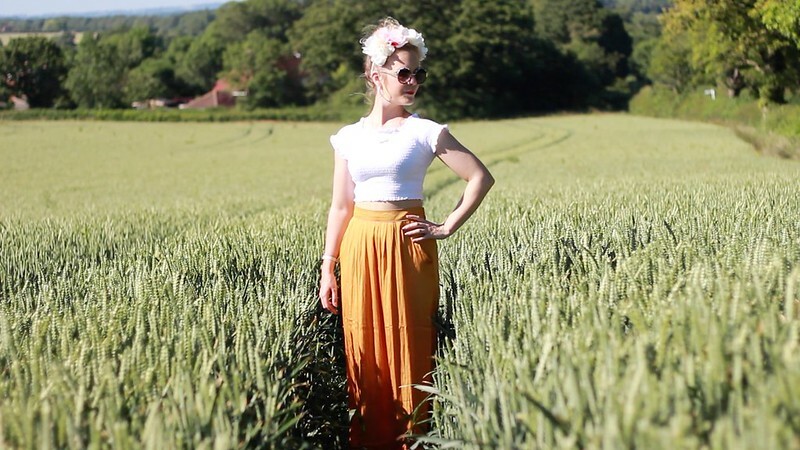 First up, this gorgeous maxi skirt and crop top combo! I picked this up from Bershka a few weeks ago in their sale. I thought it would be perfect for summer parties and evenings out. It's super comfy and the light material really helps keep you cool. I also love the high waist; ideal if you're planning on eating A LOT of burgers and bread at that BBQ next weekend! I actually tried to grab another one of these the other day as I can see myself wearing this so much this summer! This little guy is from Primark and although it is quite short, worn with a very high waisted skirt I think it looks really lovely. Another Primark find! I've worn these pretty much every day since I bought them. They are super comfy and add a bit of an edge (and height!) To any outfit. I picked this up the other week before heading to see Taylor Swift in Hyde Park for the Barclaycard British Summertime Festival. My sister and I quickly jumped into Claire's Accessories at London Victoria and chose one floral crown/ head band each. I think this adds a really feminine "festival" vibe to this look. So that's the first of 3 outfit's I'm going to be sharing with you guys over the next few weeks! Let's hope the warm weather holds up!